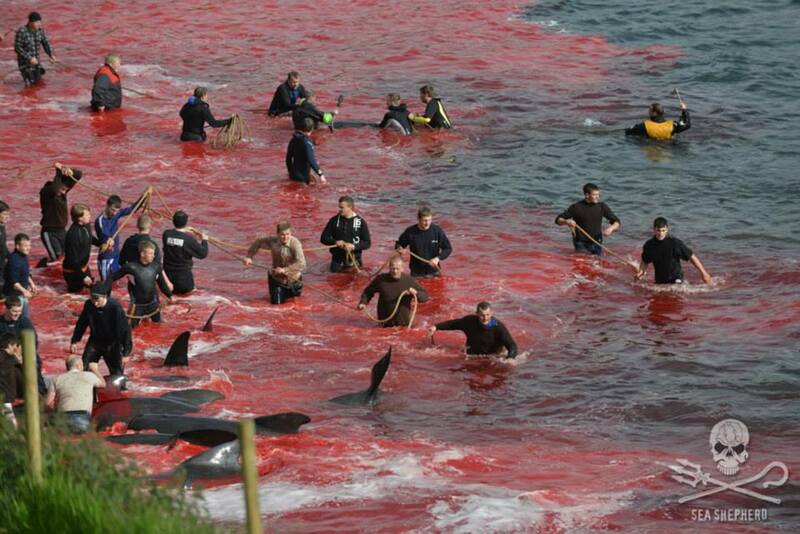 Entire pods of pilot whales and dolphins are brutally and senselessly slaughtered in the Faroe Islands. The slaughter is better known by the traditional Faroese term, grindadráp, or simply as the grind. 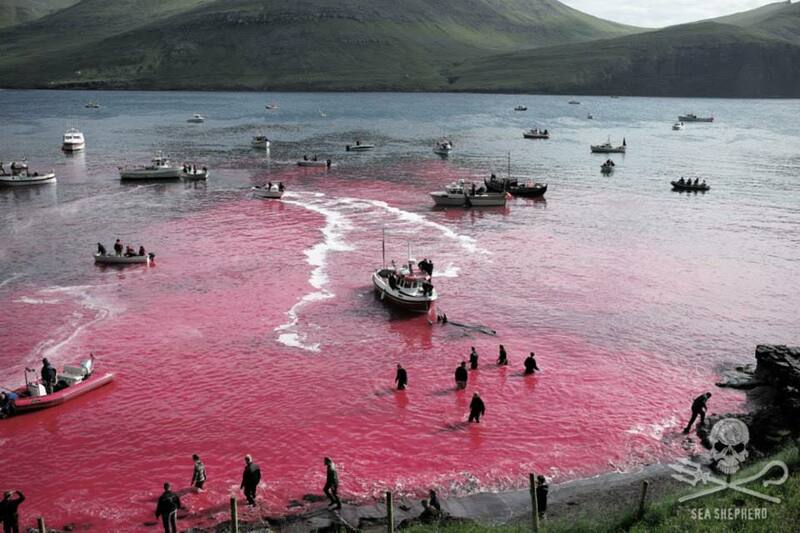 Similar to the infamous Taiji Dolphin Drive Hunt, the grind is also a blood red stain on these otherwise pristine waters. The local community heads out in small boats loaded with stones, hooks, ropes, and knives. 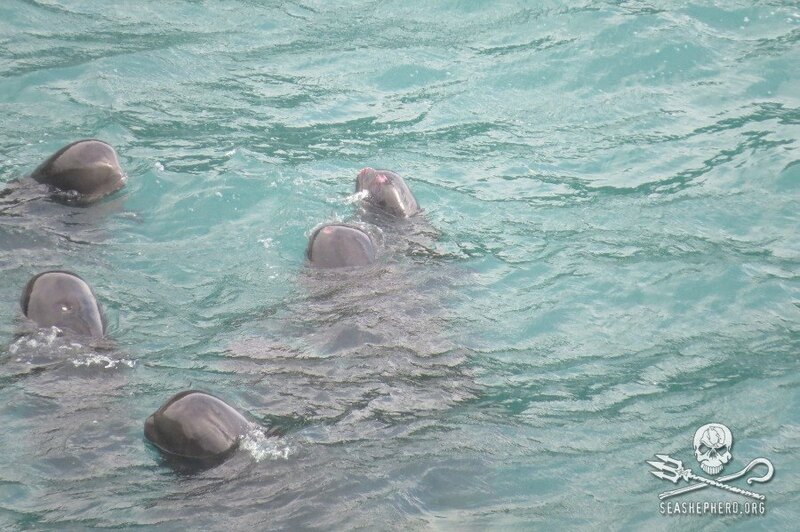 Once they’ve approached the pod, the boats form a small half-circle behind the dolphins. Small rocks attached to lines are thrown into the water to create a wall of bubbles to reflect the sonar of the pilot whale. The cetaceans interpret the bubbles as a cliff wall that they must steer away from – because of this, the small boats are able to herd the cetaceans towards a low-lying shore. As the pod approaches land, the boats continue to harass and frighten the mammals until they’re washed up on the shore. Once beached, a knife is used to cut through the veins and arteries that supply blood to the pilot whales head. Some pilot whales suffer for as much as 30 seconds while others can take up to four minutes to die. 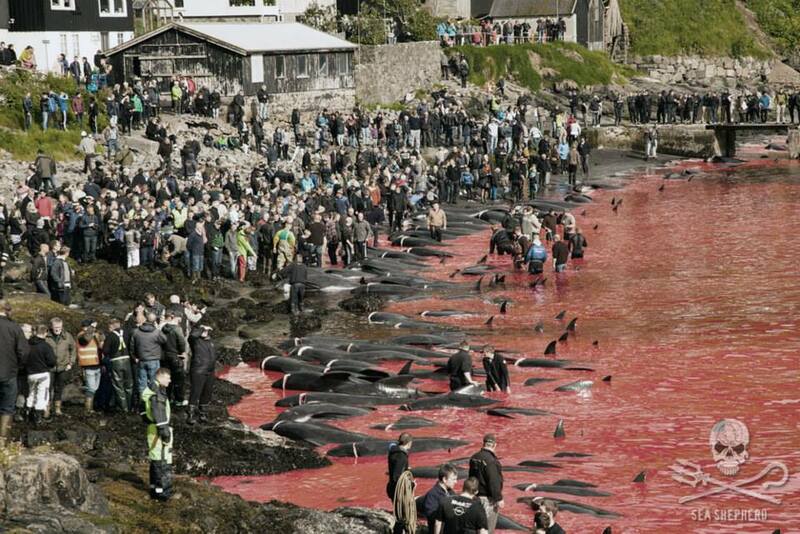 On July 23, approximately 200 hundred pilot whales were slaughtered on the killing beaches of the Danish Faroe Islands. These slaughters took place on two separate beaches in the Faroe Islands, resulting in one of the bloodiest days this year. Three Sea Shepherd crewmembers from South Africa, Belgium and Luxembourg have been arrested and another two, from Italy and France, have been detained for standing in defense of the whales that were targeted for slaughter. These people are volunteers who are opposing this atrocity by standing on the shores of the Faroe Islands armed with only a camera. 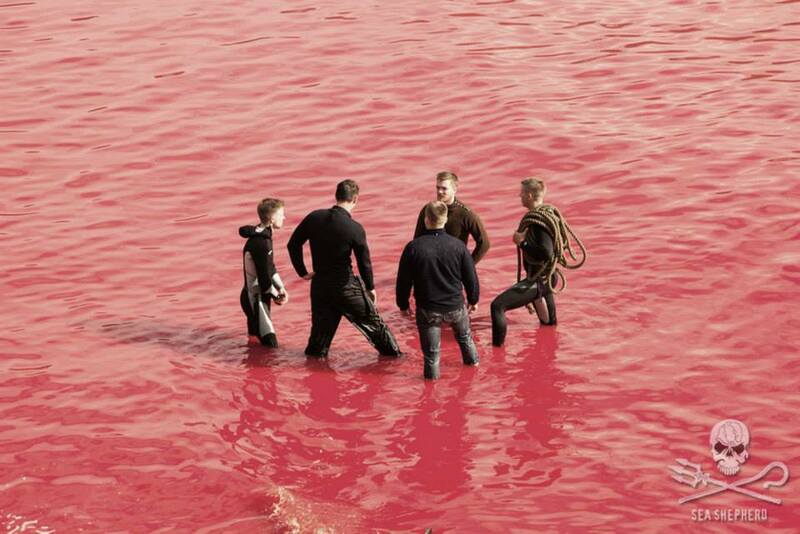 Faroese whalers standing in a sea of red blood. 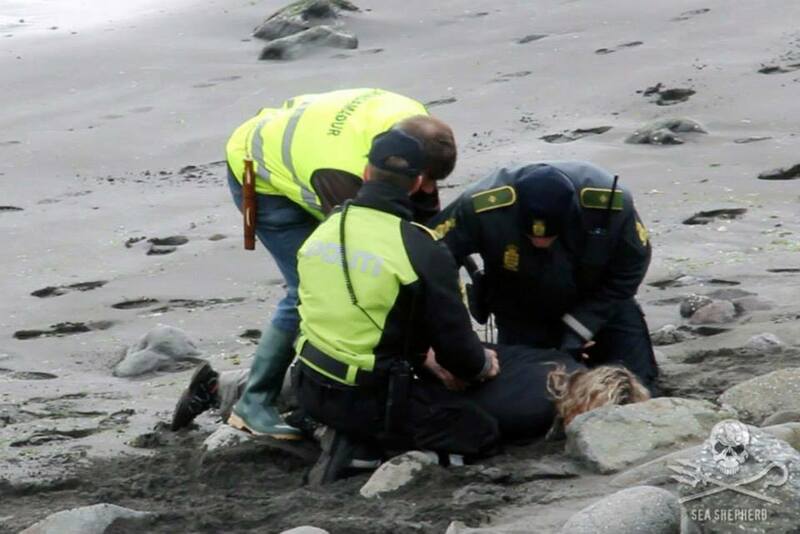 Land Team Leader Rosie Kunneke is held down with her face into the ground by three Faroese police. In 2011 not a single whale was slaughtered while Sea Shepherd patrolled the waters of the Faroes. In 2013, when Sea Shepherd was not present, more than 1,300 whales were slain. 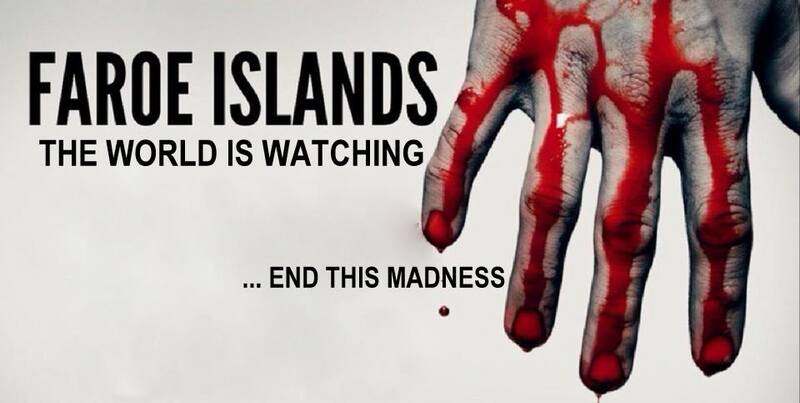 Last year in 2014, when Sea Shepherd returned, the kill was 33. What has changed so far in 2015 and why are so many whales dying this summer? Warning – the following video does contain graphic images. 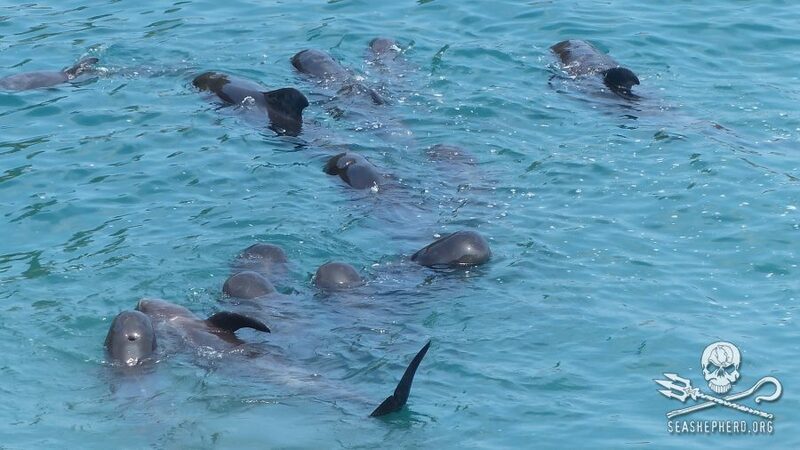 After a pod of pilot whales spent a total of 2 days netted off in the killing cove with no access to food or water, the killers mercilessly slaughtered 16 of them. 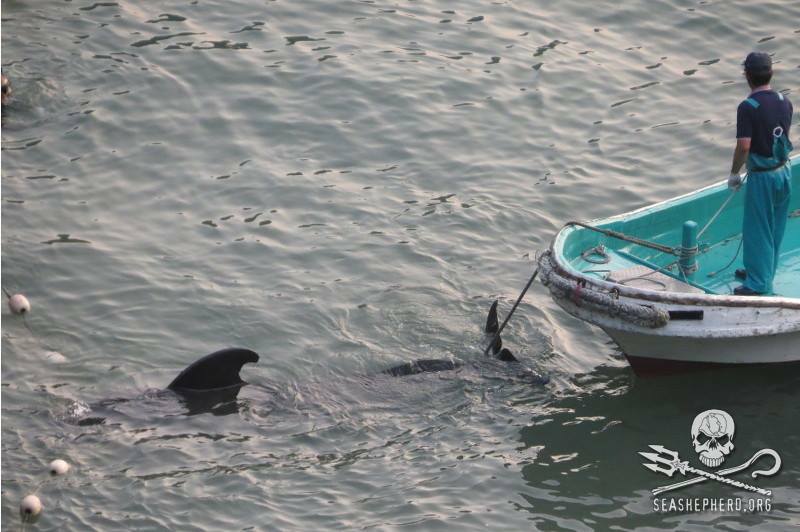 Once the killers arrived in the cove the repeatedly ran over the pod with skiffs and tethered members of the pod to the side of the cove as they awaited their fate of slaughter. Is this Taiji’s version of hunting and fishing? Starving cetaceans for 2 days and then tethering them to the cove to await their fate … this is not hunting … this is the reality of what happens between September and March of each year in Taiji. 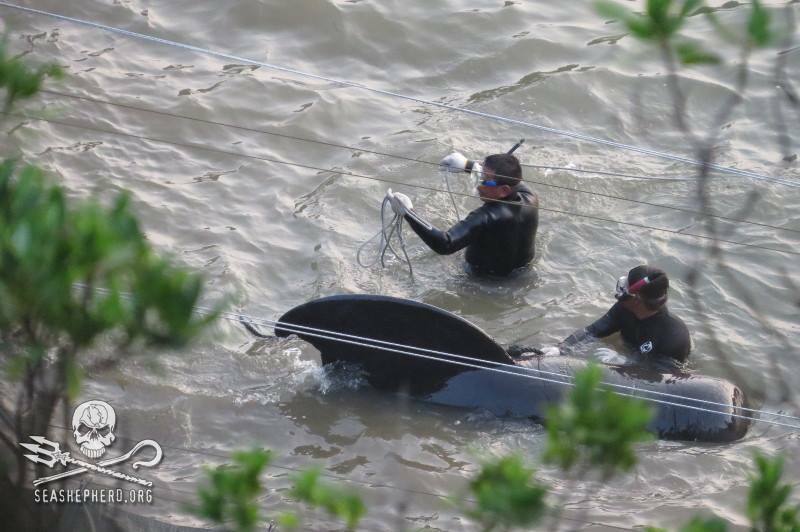 Below are photos courtesy of the Sea Shepherd Cove Guardians … who stood at the cove and witnessed this intolerable cruelty to a pod of innocent pilot whales. 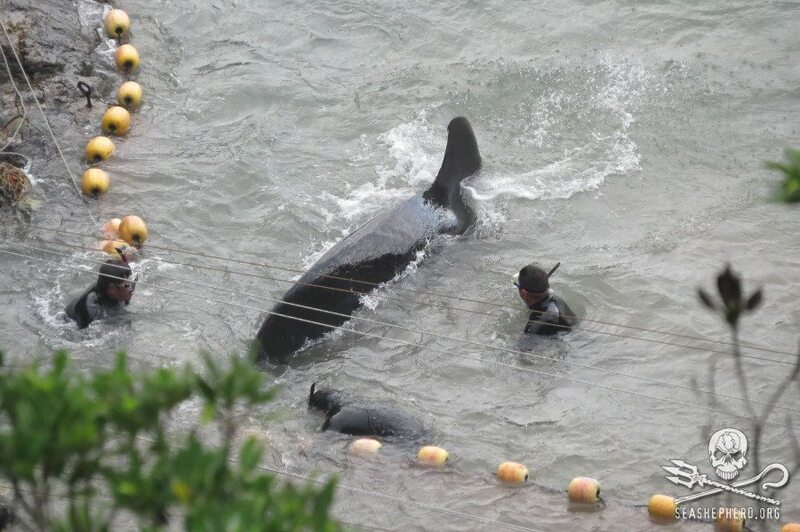 This matriarch of the pilot whale pod, struggled and thrashed for 30 minutes while tethered to the rocks of the cove. 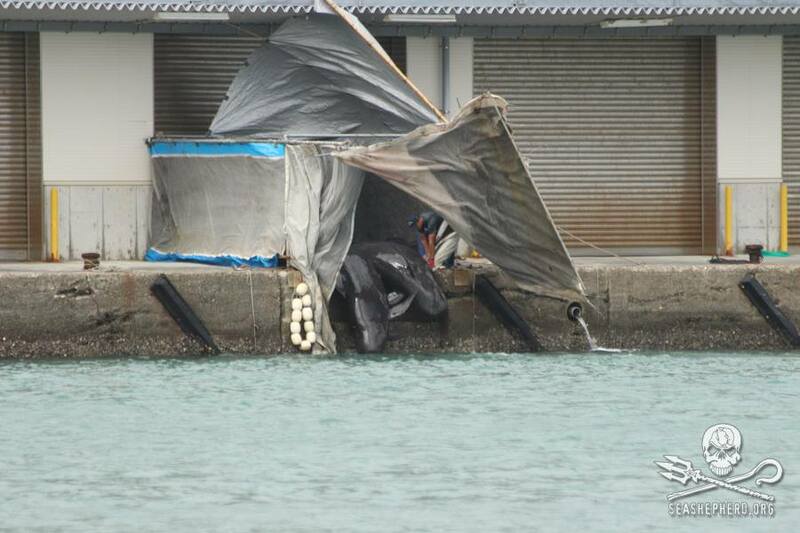 Killers eventually attempt to drag the female under the tarps for slaughter. The entire pod surrounded the matriarch as she was thrashing. The killers were unable to control the pod as they defended the matriarch of the pod. 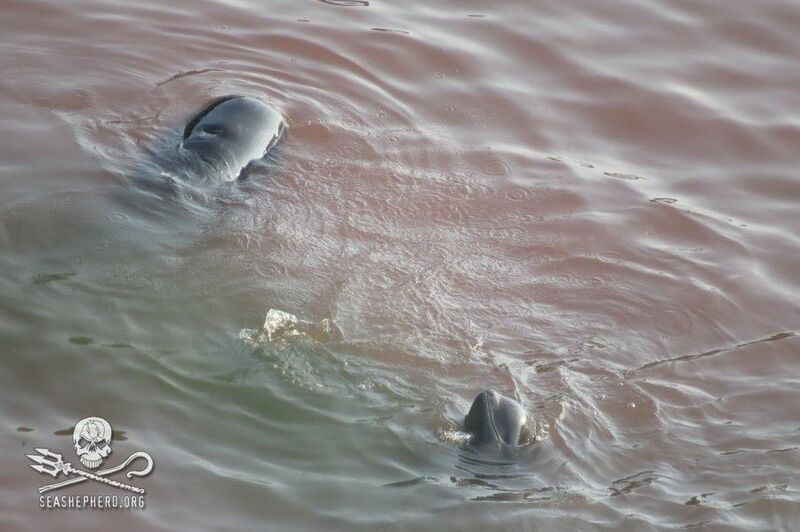 Two pilot whales cling together as they await slaughter. Another pilot whale, becomes entangled in the nets. 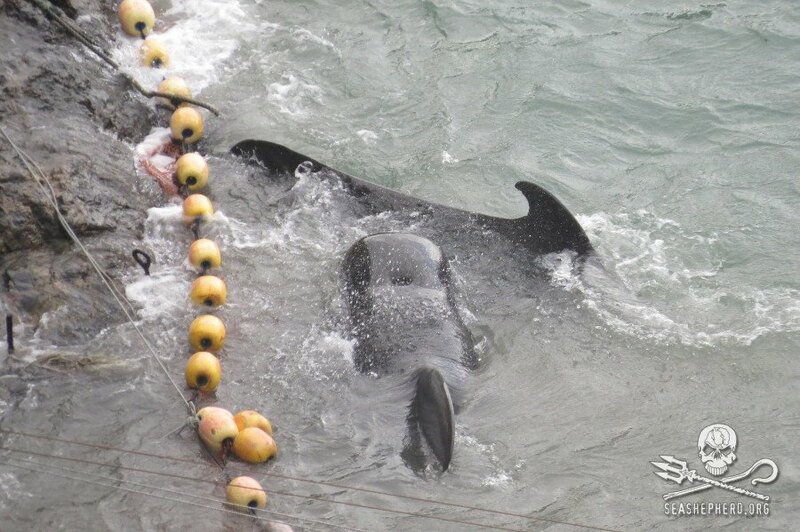 The youngest of this pod, a baby pilot whale, was badly injured throughout this process. 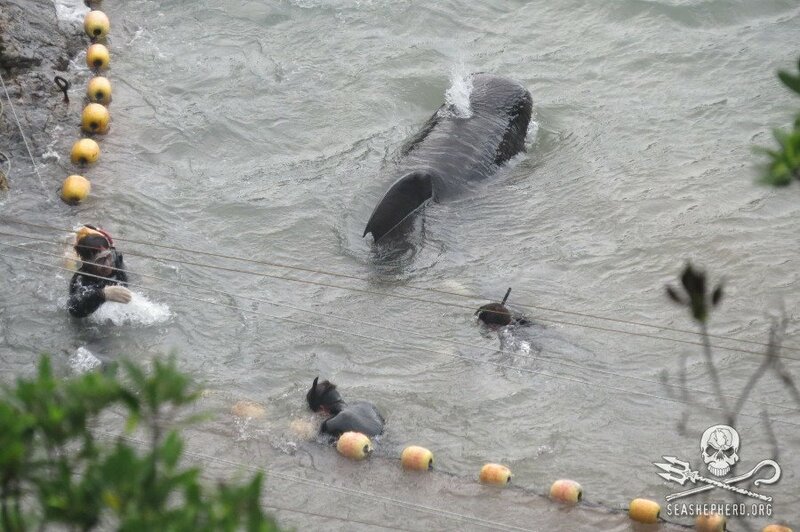 Pilot whale bodies being dragged into the Taiji Butcher house. 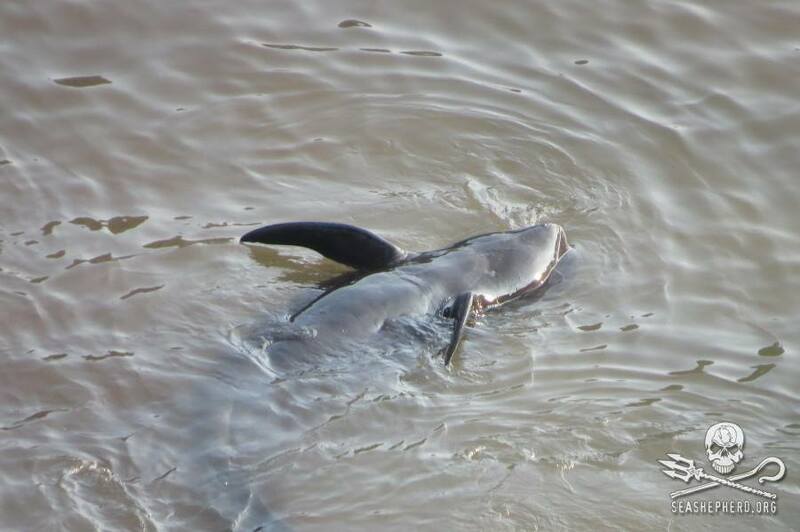 After the killing in the cove was completed the killers drove the remaining pod members back out to sea, however as reported by the Coe Guardians, 1 pod member did not fair well and its dead body was dragged back out to sea. While it may seem as though the killers showed some mercy in not slaughtering the entire pod, do not be mistaken … in the end it is all about profit and greed. The killers are given a quota for each species and with that the smaller and younger pilot whales are not worthy of fulfilling this quota. The bigger the pilot whale, the more meat and the more money it sells for … its as simple as that. Unfortunately for the remaining pod members, driven back out to sea, survival is very slim. 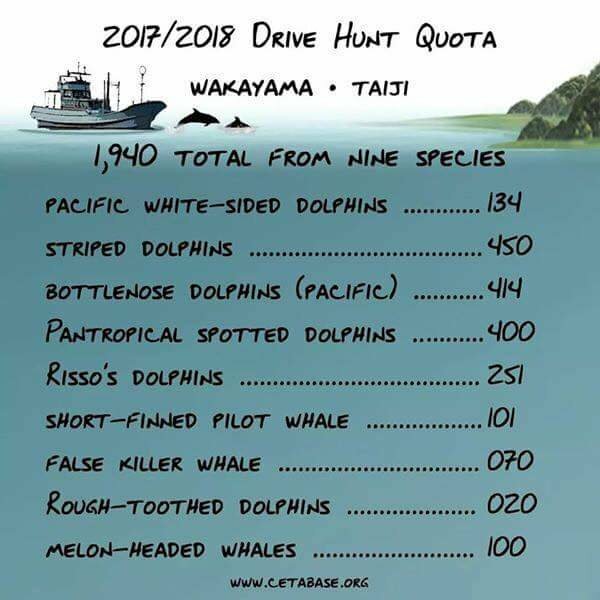 After 2 days without food and the traumatizing experience of witnessing your family slaughtered will take its toll on these innocent cetaceans. Please take the time to follow the Cove Guardians on Facebook and Twitter for daily updates. 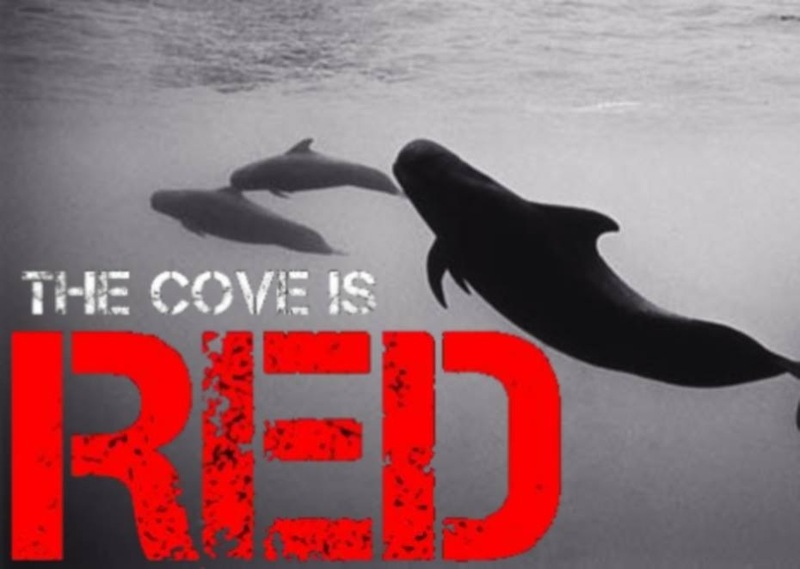 Also check out Call of the Cove … they have some great information on how to get involved and what you can do to help. For the dolphins and pilot whales of Taiji! 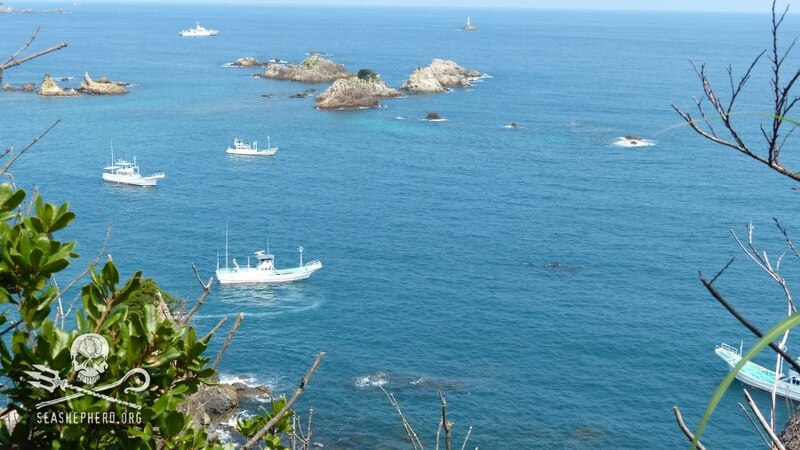 Below is a photo from Sea Shepherd Conservation Society’s Cove Guardians, taken today in Taiji. 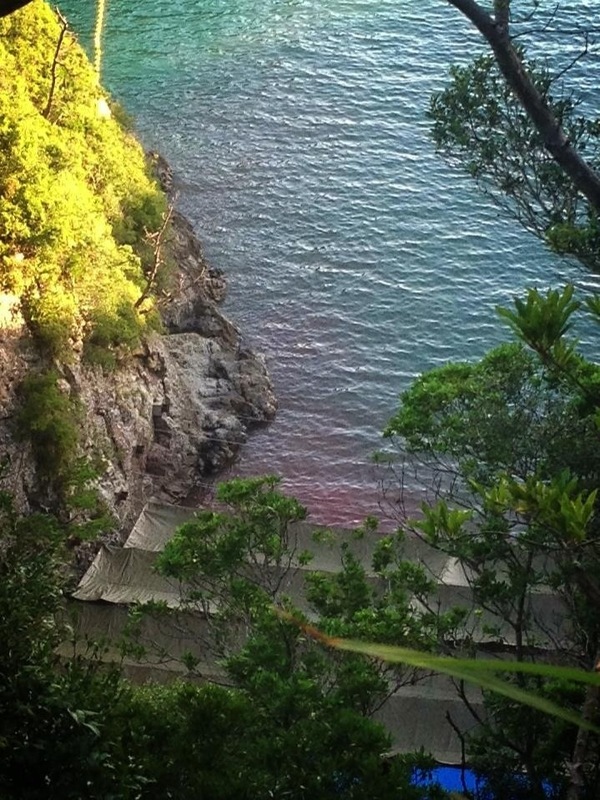 Blood tinged waters are visible now as entire pod of 25-30 pilot whales are under the tarps in the killing cove. Whales are still alive and conscious being dragged to the butcher house. 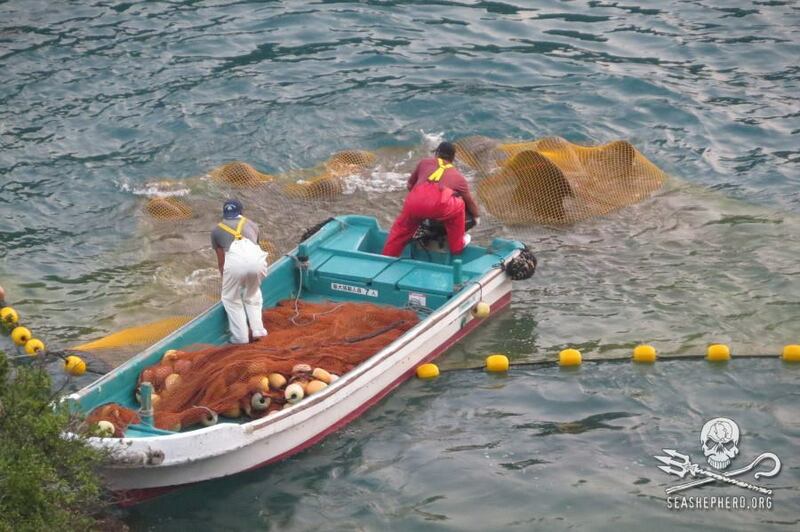 How can the mayor of Taiji claim that this is a humane killing method? 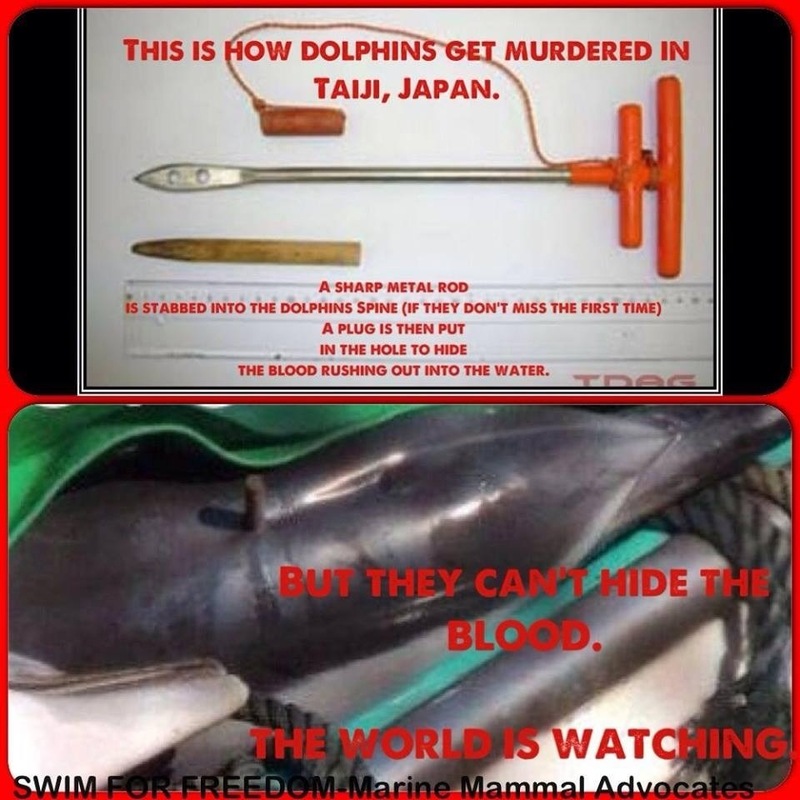 The killing tools of the Taiji fisherman. A sharp metal rod that is driven into the spine of a dolphin or whale. A plug is then inserted into the hole in an attempt to hide the blood. This is far from a humane way of killing. This process will cause paralysis but not kill and leaves a dolphin or whale still alive while being towed to the Taiji butcher house. Most of the dolphins or whales will drown while being dragged to the butcher house and those that do not are mercilessly slaughtered on arrival. Yesterday morning before sunrise the dolphin killers of Taiji were already in the water herding a family of Pilot Whales toward the shore of the killing cove for slaughter. 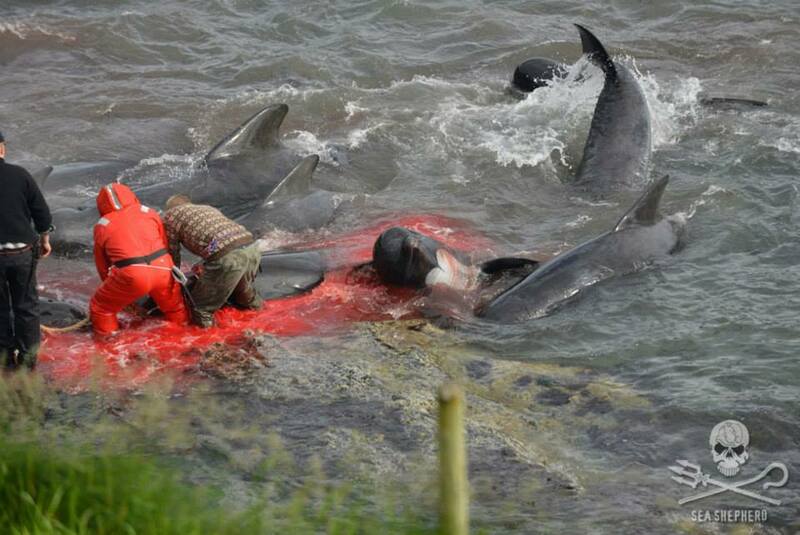 In the end a total of 18 Pilot Whales were slaughtered. These were the largest adult whales, since the juveniles and babies are not large enough and not worthy of the quota. 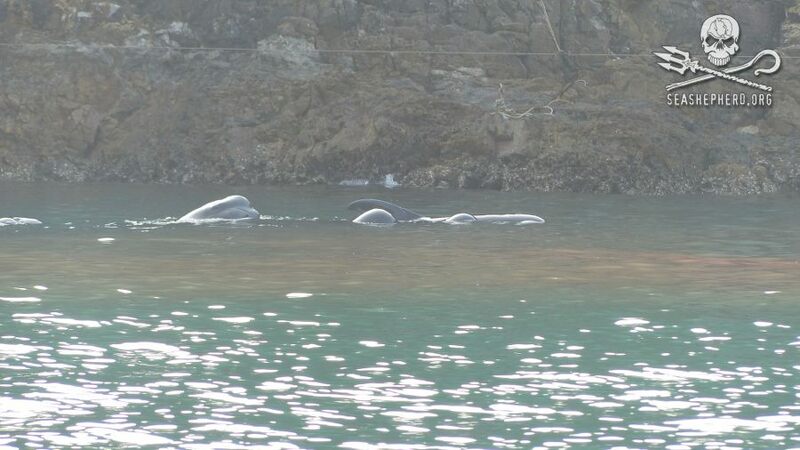 After several hours of witnessing in horror and lingering in the bloody water of the Cove next to their murdered family members these juveniles were driven back out to sea. Being left to fend for themselves, the likelihood of these young Pilot Whales surviving is slim. 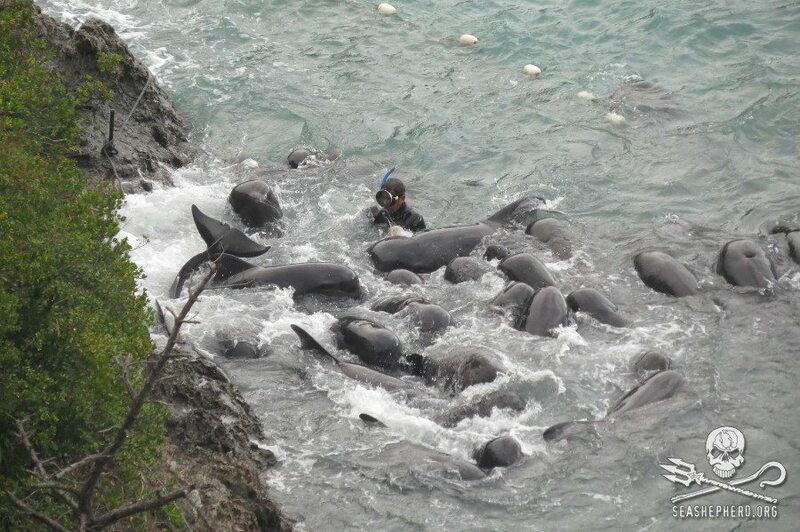 The pod begins to panic as their family members are pushed towards the shore of the killing cove. The monarch female pilot whale (largest of the pod) struggled for over an hour under the tarps, as other juvenile whales continued to linger at her side. 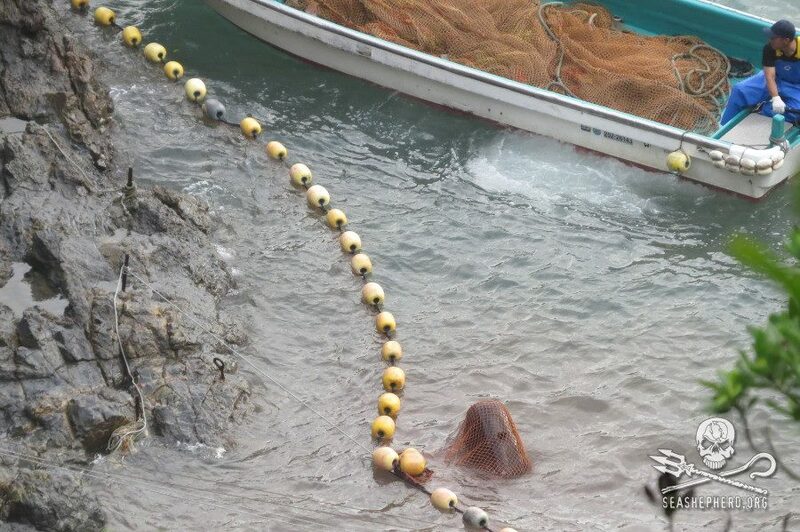 The killers tie ropes around the whales flukes to drag the to the shore of the killing cove. The trauma of the slaughter was simply too much for this Pilot Whale to bear as it continued to barely swim on its back after witnessing the slaughter of it’s family. Juvenile lingers beside it’s dying mother in the killing cove. Blood begins to seep out of the killing cove as the remaining pod is forced to swim in the bloody water of their family members. For the dolphins and whales of Taiji! With the recent release of the highly anticipated documentary, Blackfish, which provides a critical look at the family orientated Sea World’s treatment of whales, two other videos released on youtube provide further insight into Sea World’s treatment of the dolphins and whales. Distressed Pilot Whale at Sea World: Sea World find itself under fire after trainers failed to help a distress pilot whale stuck on a slideout ledge for approximately 25 minutes. The video was caught on camera by an audience member, who has stated that his views of Sea World have been changed forever. Take a look at the video below and draw your own conclusions on the treatment of whales and dolphins at Sea World. Dolphin Escapes Tank at Sea World: During a public feeding of the dolphins at Sea World, one dolphin jumped out of the tank and landed on the concrete. “I do not have children, but this is not something I would want them to see on a family vacation.” – David Kirby (deathatseaworld.com) Not only is a situation like this extrememly dangerous for the dolphin itself, as you can see in the video from the blood on the concrete, it is also an extremely dangerous situation for spectators. If a child or adult was nearby and had been injured when the dolphin jumped out of the tank, then I can assure you there would be a media storm covering this story. If you are contmeplating or even planning a trip to Sea World in the near or distant to future, then consider this: Sea World is not a place for education on dolphins and whales. The daily shows at dolphin & whale stadium and Shamu stadium are simply that a show, designed to entertain and have absoltely no educational benefit. The dolphins and whales of Sea World and conditioned to perform tricks for your entertainment receiving dead fish as their reward and in no resemble the natural habits of a dolphin or whale in the wild.